Carbonite review, looking at the features, pricing, security measures and customer service of one of the leading backup providers. Carbonite is a great choice for Windows users looking for simplicity and basic customisable features. While security features are limited and access to full features comes with a fairly hefty price tag, Carbonite remains a straightforward and user-friendly program with plenty to recommend it. You can read a detailed review below or sign up now. If you’re thinking of signing up with Carbonite you’ve got plenty of choice, as they offer three plans for personal use – Basic, Plus and Prime. The Basic plan costs $59.99 per year and is compatible with both Windows and Mac operating systems. Users receive unlimited backup for one computer, as well as a free mobile application and access to customer support. 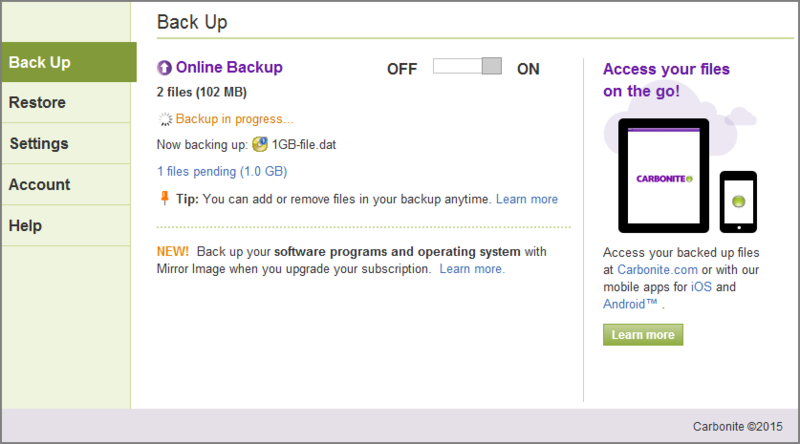 One step up the scale, a Plus subscription has all of the same features as the Basic plan, but for $99.99 per year users can also backup files from an external hard drive and make use of Carbonite’s mirror image backup system (see ‘Features’ below). Unlike the Basic subscription, however, Plus is not available for Mac users. At the top of the range, Prime users can access the full array of Carbonite features for a cool $149.99 per year, including a complimentary courier recovery service and automatic video backups. Like the Plus scheme, Prime is only available on Windows. If you’d like to give Carbonite a try before signing up, you can always opt for their free trial. This gives you access to 15 days of Basic subscription, although you won’t be able to store music or video files until you pay up for a full subscription. You don’t need to provide your bank details when you sign up, and all of your files will be permanently 15 days after the trial ends unless you purchase a paid version. Price-wise, Carbonite’s Basic plan sits in the same range as major competitors Backblaze and CrashPlan. Both also offer unlimited storage, with all three providers charging between $50 and $60 per year. Carbonite does suffer in comparison, however, as neither alternatives charge extra for full use of their features while those wanting everything that Carbonite has to offer will have to shell out considerably more. Of course, price isn’t the only factor in choosing your backup provider, and Carbonite has a lot to offer for the price. If you decide to go ahead with Carbonite, you can pay using Visa, MasterCard, American Express and Discover cards. Carbonite was founded in 2005 by Jeff Flowers and David Friend, entrepreneurs who had previously worked together to get companies including Sonexis, FaxNet and Pilot Software off the ground. Today, the Boston-based company employs over 400 people and backs up more than 350 million files for over 1 million subscribers every day. A well-established contender in the field of online storage solutions, Carbonite’s Business backup service is subscribed to by companies across a range of disciplines, from health care and insurance to real estate and non-profit. All Carbonite subscribers can take advantage of unlimited backup space – even using their Basic plan you won’t encounter any limits on how much data you can store. You can also backup most file types, although you’ll need to manually add videos (unless you’re a Prime subscriber), and any individual files that are more than 4GB in size. Carbonite backs up your data automatically, making it very easy to just set up the program and let it run and, allowing files to be uploaded with minimum effort on your part. You also don’t need to worry about manually updating your backup every time you change or create a document, as Carbonite continuously scans your computer for new and updated files and uploads them automatically. If you’re concerned about continuous backups taking their toll on your bandwidth or computer performance, then you can also set a backup schedule that runs the program only once a day at the time of your choosing. There’s also the option to stop all backups and scans during selected hours of the day – a useful way to ensure that Carbonite won’t slow things down at an important moment. Plus and Prime users have the additional option to backup files from one external hard drive. When the drive is plugged in, Carbonite will automatically upload its contents to the cloud in exactly the same way as it backs up files on your computer. This allows users to backup larger quantities of data without first having to move them all to their computer. *** FEBRUARY 2016 EDIT: Carbonite has announced that its Sync and Share app will be discontinued as of March 1st 2016. Carbonite subscribers can also download the free Sync & Share app, which is used to keep files up to date across multiple devices; from phones and iPhones to laptops, desktops, and tablets. When you update a document, the app will ensure that any changes are synchronized across all of your devices – so you can always access the most recent version of your work, no matter where you are. When you first open the app, you’ll be presented with every document that you’ve added or amended within the last 30 days, and you can access older files with a quick search. You can also share files from the application – a click will generate a link that can be sent to friends, family, colleagues and clients via Facebook, Twitter or email. We took a closer look at Carbonite’s upload and download speeds by backing up a selection of files. We then divided the number of MB in each file by how many seconds it took to upload or download, and from there calculated how many Mbps Carbonite is capable of. Our results can be found in the graph below. With an average upload speed of 2.1 Mbps, Carbonite is at the slower end of average, although not notably so. A 100MB file took around five minutes to upload, with downloads a little faster. Retrieving the same file took just under two minutes, with a more impressive average download speed of 4.2 Mbps. While we endeavor to make our speed tests as accurate as possible, it is important to remember that there are several factors that can influence the speed of your backups, from packet loss and latency to slow broadband. File versioning is the process by which you can access previously saved versions of your files, allowing you return to an earlier version of a document or identify at what point a change was made. Carbonite subscribers can access three months’ worth of file versioning. This is longer than with some of its competitors, even if it’s not unlimited. It’s a useful feature to have in any form, however, and Carbonite’s allowance is above average and should be adequate for most users. Unfortunately for Mac users, versioning is currently available for use on Windows operating systems only. Most people know the feeling of despair that comes from urgently needing a file that you’ve already deleted. Luckily, there is an answer to this problem, as Carbonite lets you retrieve files that have been removed from your computer up to 30 days after their deletion, so recently scrapped documents can be easily restored. It’s worth noting that this makes Carbonite impossible to use as a long-term storage solution, as all files stored in the Cloud but not detected on your computer will be deleted permanently once the 30 days are up. Instead, Carbonite is best used primarily as an active backup of your current work; a safety net taking care of your relevant data rather than a way to free up space on your computer. Carbonite’s Mirror Image backup lets you create a complete copy of your computer and save it to an external hard drive (though you’ll need to provide the drive yourself). It copies everything, including your installed software and operating system as well as your folders and files. This means that if your computer dies unexpectedly, you can upload the mirror image to your new PC and carry on exactly where you left off. For Personal Prime users located in the USA, there’s another layer of protection available should you lose access to your files. The Courier Recovery service costs $9.99 per use, and will deliver your backup straight to your door, courtesy of one of Carbonite’s Recovery Specialists. If you’re having problems getting online or downloading your files, they will send you an external drive or another form of physical storage media (such as a DVD) containing all of your data. You can then use this to access your data without having to connect to the internet. Carbonite’s security measures are good in some respects, but some essential features are missing. All files that they receive and store are encrypted using 128-bit SSL technology, but files are not encrypted client-side (only during transmission and while stored in Carbonite servers), so encryption is not end-to-end. It is possible to set a private encryption key, which is never known or stored by the company and cannot be reset, but this is only possible for Windows PC users, and restricts access to certain features. In Carbonite’s datacenters, you’ll find RAID 6 technology, which makes three copies of your files and spreads them across 15 disk drives – so if one drive fails, the data won’t be permanently lost. They also use the Carbonite File System (CFS) to check that no files are corrupted during the backup process, and emergency power generators, climate control, and uninterruptable power supplies ensure that neither natural disasters nor power failure have any adverse effects. Physical access to datacenters is also carefully monitored and restricted to authorized personnel only, with biometric scanners on site and extensive security procedures for staff with online access to stored files. Customer support is available from 8.30 am to 9 pm EST, with a phone line and live chat available. There is also an email-based ticketing system, which can be accessed 24 hours a day, although replies will only be sent within customer support hours. 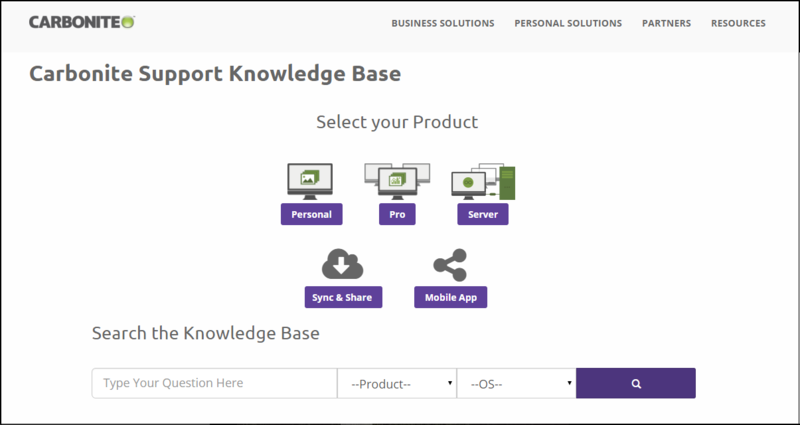 You can also troubleshoot problems by using the Knowledge Base, which features an extensive guide to using Carbonite as well as video tutorials and a few additional FAQs. The guide is an excellent resource for new users, covering every step of the process from setting up an account to restoring files with plenty of detail and supporting images. Videos and FAQ answers are short and concise and cover a good range of topics. We sent off an email ticket with a couple of questions and received a reply in around 10 hours. It’s not the quickest response time, but we were given plenty of useful information, including links to related articles on their website and further contact details. If you’re in a rush, it’s probably worth calling or using their live chat, but we were pleased with the quality of the information we received. Carbonite maintains an active social media profile, with a regularly updated blog, Facebook page, and Twitter account. There’s not a lot by way of customer support to be found here, but there are plenty of informative articles on data storage, as well as company news and updates. Before you can download Carbonite, you’ll need to register. Paid subscribers must enter their full address and phone number along with their card details while those opting for the free trial only need to give their name. During registration, you will also have to set answers to three security questions. When it comes to installation, downloading the 10MB file is easy and takes just a few minutes on a standard broadband connection. You’ll need a bit more patience while your computer is registered and your account information is downloaded from the main website, but unless you’ve got very slow internet, you should be ready to go within around five minutes. During setup, you’re given the option to choose either Automatic or Advanced settings. The former means that Carbonite will backup all of your files automatically, while the latter lets you determine your backup schedule, select which files to store and also set your own encryption key. We really appreciated being given this choice, as we like to have a little control over our backups, but of course you can choose whichever option appeals most to you. Choosing Advanced settings leads to a longer setup process, but it’s easy enough to follow and worthwhile if you want to customize the way your backup will run. As soon as the software is installed, Carbonite will start an initial backup of all of your files (excluding those in unsupported file formats). If you only want to backup specific data, make sure that you select ‘Start with nothing in your online backup’ during the installation process, as the Automatic mode won’t let you choose which files are uploaded. Should you want to backup individual files or folders, there’s no way to add them from the Carbonite InfoCenter. Instead, you’ll need to find the item you’re looking for on your computer, right click to find the Carbonite menu option, and select ‘Back this up’. After your initial backup, you can alter the frequency with which the program runs – either continuously, once a day or outside of specified hours. If you get stuck, the Help tab offers a useful range of introductory videos, on topics including restoring files, using the mobile app and how to speed up your backup. Information such as how to add individual files isn’t particularly clearly advertised, but once we’d found our feet, the backup process was reasonably straightforward. However, we did find it frustrating that there was no clear indication of how much of our data had been uploaded so far. A ‘backup in progress’ message was visible, but there was no progress bar or other indication of how things were going. It may not be a major flaw, but given that initial backups often take several days, we would have liked to have an idea of how long the process was going to take. The Carbonite mobile application is free to all subscribers, and allows users to both access backed up files and upload photos and videos from mobile devices. Browsing and downloading stored data is very easy, with a simple navigation system that mirrors the file layout on your computer, while backup is automatic, with updates every time you change or create a file. With unlimited storage space, file versioning and easily customizable settings, Carbonite is a good choice for those who want an easy-to-use backup service that can be adapted to their needs. There are companies offering similar features for a lower price, as well as others offering more extensive security features, but Carbonite’s reliability and reputation do much to recommend it. It’s a good quality program that will appeal to both novice and middle-range users. WARNING: Carbonite does not backup very important files that you put in your Mac Home directory. I called a tech support person after I couldn’t find some of my files and they told me the only files it doesn’t backup are video files. Not true. I’ve since learned there are over 100 file types that Carbonite doesn’t backup. Some of them very important. I made the mistake of paying for 2 years of service instead of just one. I asked for a refund and they refused saying it was past the 30 day trial period. I’ve also seen other reviews that say they automatically charge your credit card again when your service expires. That person had trouble getting a refund too until they finally had to contact the Better Business Bureau. Do your research and you’ll find better alternatives such as iDrive or CrashPlan. What do you think of Carbonite? Leave your reviews and comments here!